Now it gets hectic. In the Dunnville Chronicle of 1905, I find a very short note that states the East Pier is being rebuilt. That is the extent of any information for the year of 1905. But wait a minute in an article dated 1906, in the same paper there is an estimate that the cost for the renewal of the entrance pier will be thirty thousand dollars. A few more details come to light a couple months later when in May of 1906 I discovered that Superintendent Weller of the Welland Canal was in Port Maitland and Dunnville, making preparations for rebuilding the East Pier at Port Maitland which was partly washed away the previous fall. Mr. Weller granted permission to members of the Lower River Knockabout Boating Club to build a dock at the north end of the Long Bridge and will let them have the timber and planking required from the pier which was to be torn down. Construction continued into 1907, when the Chronicle reported that Ed. Martin and Mr. LeRoy, the foreman at the work on the pier left on Friday for Cobalt. Then in the fall “Mr. Big Dipper and Redskin” were reported to have completed their work and left for Thorold. I can only guess who or what Mr. Bid Dipper and Mr. Redskin were! In 1908, there was a series of advertisements in the local papers requesting sealed tenders for repair to the West Pier. They were to be sent to L. K. Jones, Secretary for the Department of Railways and Canals by August 14th. This finally will lead us to the photos mentioned in the opening article in this series. In one of the 1909 construction photos you will see the wood planking and stringers from an earlier attempt to build something that hopefully this time will stand up to the wrath of Mother Nature. During the 1909 reconstruction project large concrete coping blocks were placed on and around the old wooden-beam pier in hope of finally holding back the ravishes of the many storms which could be expected to smash into the harbour. Let us jump ahead nearly one hundred years for just a sentence or two, and compare two photographs. One is from the photos borrowed from June High the other is one I took on Sept 9, 2002 during the last reconstruction project on the West Pier. In June’s photo as mentioned above you can see the wooden-beams. If I were a better photographer and could have climbed down into the bowels of the construction you would have been much better able to see those same wooden beams shown in June’s much better photos. They lay in the shadow just below water level. In 1920, we would see improvements to the West Pier when the lighthouse was modernized. The improvement was described as “the enlargement of the fog horn house and the installation of more powerful machinery.” In addition to the rebuilt lighthouse a sixty-foot tower was added. This was the range light which was installed on September 24, 1920. It took about four days in all to complete the job. So why do I tell you the exact date? Because in October 2000, I wrote an article in the Chronicle stating that the top section of this very range light was now in the possession of Bill Moyer of Port Maitland. The tower had been removed on September 26, 2000, as nearly exactly to eighty years as one could arrange. As I write this article we are working with Haldimand County to install this piece of history in Esplanade Park in Port Maitland. The summer of 1929 saw a major reconstruction project take place on the West Pier when a contract for nearly one hundred thousand dollars was awarded to Cameron and Phinn of Welland. I have no information what was repaired or built during that project. The summers of 1924 through 1929 saw the construction of the Port Colborne and Port Maitland piers. The construction of both piers took place on the north side of the Feeder canal between where Dan Minor docks his fish tug today and Talisman have their rigs docked. Concrete cribs were built and floated into place, then sunk, resting on the lake bottom. This story could take a full article in its self. Maybe that is a subject for another series. It was during this time that the old wooden East Pier was removed and the pier replaced in 2002 was built. We are all familiar with the new break wall and how it was built in two sections. I am sorry, but I must editorialize a bit here. When the current break wall was being planned, the story has it that a break would have to be established in the break wall. This at least was according to Fisheries and Oceans Canada. The reason given was because the fish were accustomed to having the break in the former concrete pier and filling in the gap would disrupt their breeding habits. Now really, are you serious! The break, as we knew it while growing up was not designed into the original pier. I have not found any documentation of exactly when the East Pier was placed there but the best I can suggest is that it was in the summer of 1929. The break occurred on February 25, 1930 when ice jammed between both piers and forced the water to go under the cribs which were simply sitting on the sandy bottom. Soon the soft sand which had already been compromised by the years of aqua quarrying by the sand suckers slipped away and the section at the bend of the pier sank. I just bet you the fish were delighted to begin their new breeding habits which would last for seventy-two years, and then be preserved for eternity by our kindly fisheries personnel! End of editorial! If you want to see the only known photo of the East Pier before the break occurred visit the Port Maitland lock and see our new information board. Other work has been done to save the West Pier in the years since 1929, though I am not familiar enough with what that has been to tell it here. The 1929 project seemed to be the one that has lasted the best of all the efforts. Only those of you who are young enough to have many years ahead of you will know how the 2002 reconstruction will last. I was fortunate enough to have access during construction and attempted to photograph shots similar to those that June High loaned me. Construction of the West Pier was major. 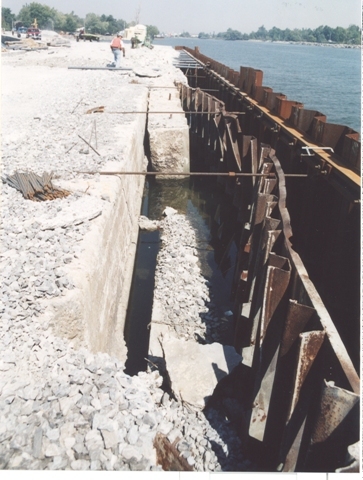 The entire concrete surface was removed, pilings were driven into the river approximately two feet from the side of the old pier and the outer wall was removed. New concrete was laid on top of and within the cavern created by the pilings. Electrical wiring was reinstalled for the light standards and the light house. Now we wait to see what Mother Nature has in store for our old but new again piers! Please take note in the two photos with this article; they were both taken from nearly the same place. One was taken in 1909, while the other was in 2002. If I were a better photographer, you would be able to identify the 1909 work in the 2002 photo.